In 2008, Facebook chief executive Mark Zuckerberg proposed a social networking analog to Moore’s Law, which states that the number of transistors on a chip doubles every two years. “Next year,” Zuckerman posited, “people will share twice as much information as they share this year . . . [t]hat means that people are using Facebook, and the applications and ecosystem, more and more.” Recent studies suggest that individuals are willing to trade privacy in exchange for small rewards and convenience. As the online marketplace is embracing social networking and the “free” economy, people are increasingly faced with limited bargaining power and ignorance about what information they are offering in exchange for services. In order to address many of these issues, the British public-service broadcasting network Channel 4 has paired with veteran alternate reality game designers at Six to Start to create “Smokescreen,” a 13-part online adventure designed to educate youth in the UK about issues of online privacy, identity and trust. The online game will be released in September. Providing information about yourself on the internet is not in and of itself a bad thing. However, disclosing information should be an informed choice. 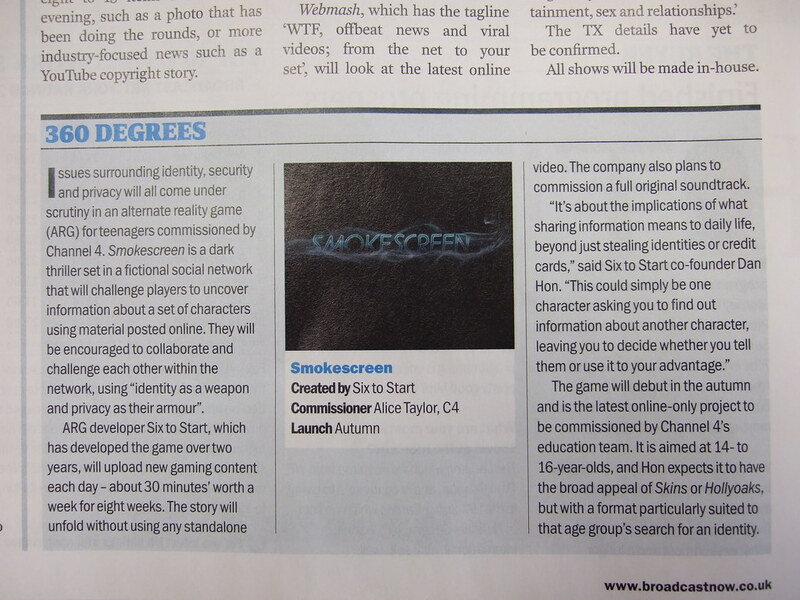 And “Smokescreen” is a step in the right direction towards fostering media literacy. It is awsome! It’s like Jamie Kane but maybe not as good. Maybe this is a stupid question, but will this be available for people in the u.s.? Isaac: no, that’s not a stupid question. I checked with Adrian Hon, and he clarified that there is no territory blocking for Smokescreen, so you’ll be able to enjoy the full experience outside the UK. Yeah I’ve to agree with the first comment, I wish it would be more realistic in terms of chatting via IM– you choose what you say instead of allowing you to type. I’m still having trouble finishing up the second part of the game though, it’s a wee bit confusing.